Single crystals of Nd4FeOS6 were grown from an Fe–S eutectic solution. Single crystal X-ray diffraction analysis revealed a Nd4MnOSe6-type structure (P63mc, a=9.2693(1) Å, c=6.6650(1)Å, V=495.94(1) Å3, Z=2), featuring parallel chains of face-sharing [FeS6×1/2]4− trigonal antiprisms and interlinked [Nd4OS3]4+ cubane-like clusters. Oxygen atoms were found to be trapped by Nd4 clusters in the [Nd4OS3]4+ chains. Structural differences among Nd4MnOSe6-type Nd4FeOS6and the related La3CuSiS7− and Pr8CoGa3-type structures have been described. Magnetic susceptibility measurements on Nd4FeOS6 suggested the dominance of antiferromagnetic interactions at low temperature, but no magnetic ordering down to 2 K was observed. Spin-polarized electronic structure calculations revealed magnetic frustration with dominant antiferromagnetic interactions. This is a manuscript of an article published as Lin, Qisheng, Valentin Taufour, Yuemei Zhang, Max Wood, Thomas Drtina, Sergey L. Bud’ko, Paul C. Canfield, and Gordon J. Miller. "Oxygen trapped by rare earth tetrahedral clusters in Nd 4 FeOS 6: Crystal structure, electronic structure, and magnetic properties." 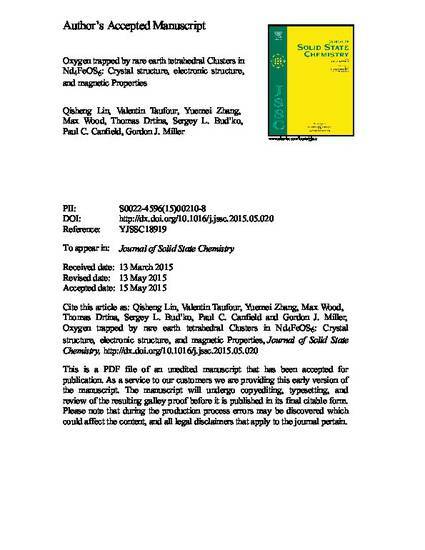 Journal of Solid State Chemistry 229 (2015): 41-48. doi: 10.1016/j.jssc.2015.05.020. Posted with permission.